The Finnish Handset maker expanded its Asha series portfolio to Nokia Asha 500, Nokia Asha 502 and Nokia Asha 503. The Nokia Asha 502 is a successor of Nokia Asha 501, which was very popular in India and both of these smartphones now have the WhatsApp messenger available on them with the new update. Let’s take a look at what Nokia Asha 502 is offering. The Nokia Asha 502 offers 3 inch TFT LCD 2 point multitouch display with 320 x 240 pixel resolution similar to Asha 501 and Asha 503. The pixel density of 133 pixels per inches isn’t very impressive on paper, but considering the screen size and intended usage. We observed good colors and easily readable texts on the display in our time with the device. Unlike the Nokia Asha 503, the display is not protected by Corning gorilla glass 2 in Nokia Asha 503. The Nokia Asha 502 is based on Nokia Asha Platform 1.1 similar to other Asha phones and you will get 64 MB of RAM and 64 MB of onboard memory. The Hardware specs are at par with feature phones. The internal storage can be expanded to 32 GB using a MicroSD card. 4 GB card will come bundled with the phone same as with Nokia Asha 501. Along with WhatsApp, Facebook and Twssitter App also come pre-installed on this smartphone. The phone is meant to be a high end feature phone with social networking option and that’s what you should expect from this phone. The Fastlane app remembers your last activities including the music you played for easy switching. It also allows you to conveniently share pictures on social media platforms. This app will also give you one swipe access to the camera app from lock screen. The primary camera in this phone has a 5 MP sensor and will give you decent pictures in good light. The video recording capabilities however will be limited. No front camera is present for video calling. considering the Megapixel count, you can expect the camera to be slightly better than that present in Nokia Asha 501. The Battery capacity is 1010 mAh which Nokia claims will give you talk time of 13 hours and music playback time of 40 hours. 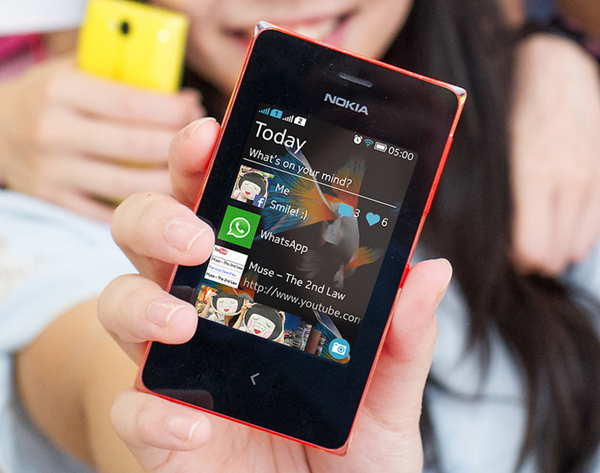 Battery backup has never been an issue with Nokia smartphones and we expect Nokia Asha 502 to be no exception. The phone is 11.24 mm thick which makes it slimmer than its predecessor Nokia Asha 501. The phone weighs 101 grams which makes it quite comfortable to hold. The whole body is enclosed in a plastic casing which gives it a premium feel. The phone is available with 6 bright colors to pick from. Nokia Asha 502 supports Dual SIM with Dual Standby, but unlike Nokia Asha 503, 3G connectivity is not present and this constitutes the major difference between Nokia Asha 503 and Nokia Asha 502. Also the SIM card accepted will be Micro-SIM and not the regular sized ones. This basic phone will compete against other Asha series phones like Nokia Asha 500, Nokia Asha 501 and Nokia Asha 503. The phone will also present a more durable option to other basic budget android phones like Lava Iris 356 and Intex Cloud X3. At a price of approx Rs. 5,800 INR, Nokia Asha 502 is a basic phone which supports popular social networking apps which makes it a very attractive feature phone and a better option over budget Androids if that matches your usage pattern. The 2 G connectivity will work just fine for basic social networking, but if you can’t do without high speed internet, opt for Nokia Asha 503 instead.